Stewart Lee’s twenty-first century television output continues with a second series that perhaps wasn’t expected to see the light of day. Maybe ‘light of day’ isn’t the right turn of phrase, considering Comedy Vehicle now goes out past 11pm on a Wednesday night, though I doubt either Lee or his fanbase have serious problems with that scheduling. If Lee’s work were competing with more mainstream comedic programming, up against the likes of Mock The Week or Have I Got News For You, then it’d be more open to public scrutiny, and there’s a large chunk of the potential audience out there who won’t get on too well with this stuff. That’s not to say people are too stupid for Lee’s technique, though some undoubtedly are. Aside from those, there are people who get it but simply don’t get on with it. His patterns of repetition annoy a lot of folk, whilst his tendency to deconstruct his own act, while it’s actually in progress, will bug those who find the process a little too fussy. Comedy’s a very subjective thing, clearly, so it might be best that Comedy Vehicle’s not entirely buried, but slightly submerged in the listings. Having said that, it’s a real shame that panel show mediocrity fills the mainstream hours whilst content like that in this first episode is somewhat less available. In the opener, there was a slightly different construction to the show from last series, with a central, pre-show interview with Armando Ianucci forming a contextual reference point (wherein Lee explained he only had four, maybe three jokes) and a brilliantly extravagant sketch finishing things off, all around a stand up routine that was, as usual, oblique, painfully clumsy and brilliantly messy. The repetition of the word ‘crisps’ shouldn’t be funny, and wouldn’t be in the hands of a lesser talent, but here it provided gold in a routine about Stewart Lee’s fictional grandfather, his attitude towards the Japanese people and his home/nest, made out of unlikely materials. It was no surprise Arnold Brown was involved somewhere in the writing, and it was pleasing to see this distinguished old timer make a very small cameo. Also not a shocker was the listing of Chris Morris and Armando Iannucci in the scripting and writing credits. With all this major talent and with the best opening episode of a comedy series this year, it would be mystifying as to why a show of this calibre has to be shown close to midnight in the middle of the week, if we didn’t all already understand the BBC’s problem when transmitting work like this. They’ve already created a prime-time that’s stuffed with rubbish. 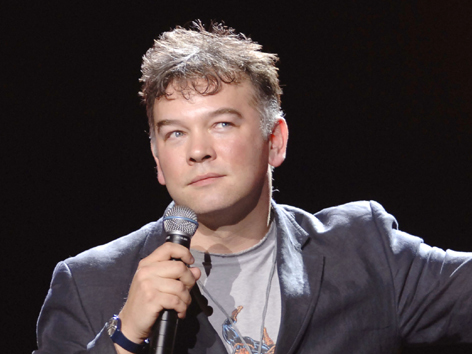 If Stewart Lee’s Comedy Vehicle showed up in the middle of all that ropey content, it’d stick out like a sore thumb. People would become frightened and incontinent – so it’s probably best to shove it where only those in the know will find it.